One time band available at the Giftwrap is the best hand strap lanyard you can own to make your presence felt in the crowd. You can wear this one time band on your wrist on some party or concert and make yourself stand out from the rest. It is made from Petersham material with full color branding. A variety of designs of one time band is available at Giftwrap for you to select at the most affordable rates. 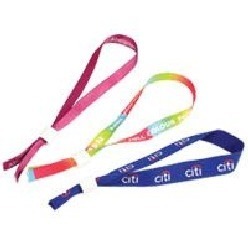 Hand strap lanyards are usually worn on parties and concerts. For anyone who wants a nice one time band, the one at Giftwrap is an interesting find. An adjustable hand strap, the hand strap lanyards are made out of petersham material and have their full color branding done. Moreover, you can find the one time band in screen print and dye sublimation, the choice is yours. Get the hand strap lanyards at Giftwrap and start wearing them to stand out in the crowd. These lanyards are available in different designs so you can categorize your choice and make a choice accordingly. The best part is that they are affordable so you can even get them in bulk.